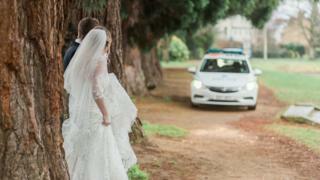 Newlyweds had a surprise when their wedding draws were interrupted by a police chase. 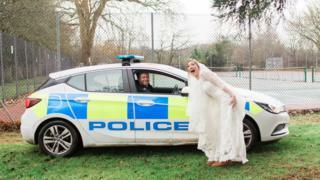 Toby and Becky Eyre were posing for photos in Oxford’s Hinksey Park on Saturday when police arrived. “At first we just experience a boy passing and heard police wailing ‘stop’ … We tried to get out of the way as much as possible, ” said Mr Eyre. Officers prepared two seizures before returning for photos who the hell is shared on Thames Valley Police’s Twitter feed. Mrs Eyre said they had chosen the park for photos as they missed a quiet time to celebrate their bridal away from the church and reception. She described how they envisioned a being come flowing round the pond and right past them before jump-start in the water. They did not see the three arrested but police afterwards supported two men were held on idea of wealth with intent to supply class A drugs. 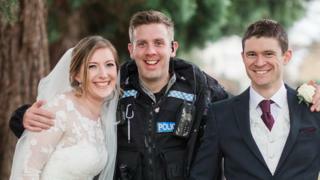 The bride said the officers were “focused on the job in hand” but subsequently interpreted “light of the situation” and drove past to apologise and met them for a “free photo shoot”. The story eventually get “a few laughs” when they returned to the wedding night, Mr Eyre added.